Synopsis: “When a group of hard working guys find out they’ve fallen victim to a wealthy business man’s Ponzi scheme, they conspire to rob his high-rise residence” (United International Pictures). Verdict: It’s not as bad as the early reviews suggest. 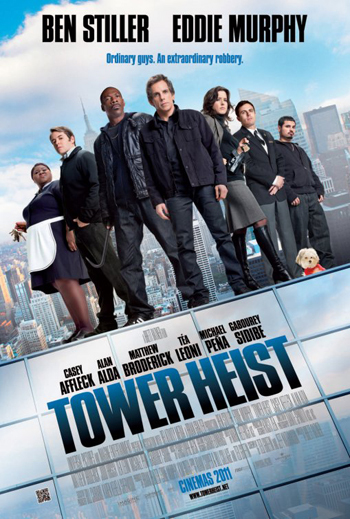 Tower Heist is not a parody of robbery films. Instead, it’s a comedy version of the genre. A very decent one for that matter. Yes it’s forgettable, it’s a little racist, it’s funny largely because of Eddie Murphy, there’s no chemistry between the actors, BUT at least it’s enjoyable. It also has a little purpose of showing why being a nice person or a nice boss pays. Racism: In the movie, Josh (Ben Stiller), a white man, gets a black guy, Slide (Eddie Murphy), to teach him how to rob and steal. Favourite quote: [SPOILER BEGINS HERE] “Never leave your wallets to a thief,” says Slide in response to the others that want him to prove his worth as a criminal [SPOILER ENDS HERE]. The ending: [SPOILER BEGINS HERE] Josh manages to get a deal with the police to let his accomplices walk by handing over precious evidence against Arthur Saw (Alan Alda) and sacrificing himself for a 2-year sentence. The car made of gold is chopped up by the rest before delivering them to the doorsteps of the tower’s staffs. A happy closure where all characters get what they deserve [SPOILER ENDS HERE]. Being a typical Malaysian, [SPOILER BEGINS HERE] I would likely throw away the car part if I received one without knowing why. I wouldn’t even think that it’s made of real gold [SPOILER ENDS HERE]. Second opinion: “Liked it” (Iris Loong). The invitation to the premiere screening of the film was courtesy of MSN Malaysia. Both my favo actors… yes, must watch!! I am the number one fan of Ben Stiller though not much of Eddy Murphy. Thank for the review but will get a VCD and watch at home. uuuuhhh~~~ I've been wanting to watch this. Is it worth going to the cinema for?